Budd Schulberg (March 27, 1914 – August 5, 2009) was an American screenwriter, television producer, novelist and sports writer. He was known for his 1941 novel, What Makes Sammy Run?, his 1947 novel The Harder They Fall, his 1954 Academy Award-winning screenplay for On the Waterfront, and his 1957 screenplay for A Face in the Crowd. Born Seymour Wilson Schulberg, he was raised in a Jewish family the son of Hollywood film-producer B. P. Schulberg and Adeline (Jaffe) Schulberg, who founded a talent agency taken over by her brother, agent/film producer Sam Jaffe. In 1931, when Schulberg was 17, his father left the family to live with actress Sylvia Sidney. His parents divorced in 1933. Schulberg attended Deerfield Academy and then went on to Dartmouth College, where he was actively involved in the Dartmouth Jack-O-Lantern humor magazine and was a member of the Pi Lambda Phi fraternity. In 1939, he collaborated on the screenplay for Winter Carnival, a light comedy set at Dartmouth. One of his collaborators was F. Scott Fitzgerald, who was fired because of his alcoholic binge during a visit with Schulberg to Dartmouth. Dartmouth College awarded Schulberg an honorary degree in 1960. While serving in the Navy during World War II, Schulberg was assigned to the Office of Strategic Services (OSS), working with John Ford's documentary unit. Following VE Day, he was reportedly among the first American servicemen to liberate the Nazi concentration camps. He was involved in gathering evidence against war criminals for the Nuremberg Trials, an assignment that included arresting documentary film maker Leni Riefenstahl at her chalet in Kitzbühel, Austria, ostensibly to have her identify the faces of Nazi war criminals in German film footage captured by the Allied troops. Being the son of a successful Hollywood producer, Schulberg had an insider's viewpoint on the true happenings of Hollywood, and his literature and film reflected this. His most famed writing What Makes Sammy Run? allowed the public to see the harshness of Hollywood stardom via Sammy Glick's Cinderella story that does not end happily ever after. This novel was criticized by some as being self-directed antisemitism. In 1950, Schulberg published The Disenchanted, about a young screenwriter who collaborates on a screenplay about a college winter festival with a famous novelist at the nadir of his career. The novelist (who was then assumed by reviewers to be a thinly disguised portrait of Fitzgerald, who had died ten years earlier) is portrayed as a tragic and flawed figure, with whom the young screenwriter becomes disillusioned. The novel was the 10th bestselling novel in the United States in 1950 and was adapted as a Broadway play in 1958, starring Jason Robards (who won a Tony Award for his performance) and George Grizzard as the character loosely based on Schulberg. In 1958, Schulberg wrote and co-produced (with his younger brother, Stuart) the film Wind Across the Everglades, directed by Nicholas Ray. Schulberg wrote the 1957 film A Face in the Crowd starring newcomer Andy Griffith in which an obscure country singer rises to fame, and becomes extraordinarily manipulative to preserve his success and power. Schulberg was also a sports writer and former chief boxing correspondent for Sports Illustrated. He wrote some well received books on boxing including Sparring with Hemingway. He was inducted into the Boxing Hall of Fame in 2002 in recognition of his contributions to the sport. In 1965, after a devastating riot had ripped apart the fabric of the Watts section of Los Angeles, Schulberg formed the Watts Writers Workshop in an attempt to ease frustrations and bring artistic training to the economically impoverished district. In 1982 Schulberg wrote "Moving Pictures, Memoirs of a Hollywood Prince", an autobiography covering his youth in Hollywood growing up in the '20s and '30s among the famous motion picture actors and producers as the son of B.P. Schulberg, head of Paramount Studios. Schulberg at the 2007 Tribeca Film Festival. Schulberg was married four times. In 1936, he married his first wife, actress Virginia "Jigee" Lee Ray. They had one daughter Victoria Schulberg Kingsland In 1943, he married Victoria "Vickee" Anderson; they had two children: Stephen (born 1944) and David (born 1946). David was a Vietnam veteran who predeceased his father. They divorced in 1964. In 1964, he married actress Geraldine Brooks until her death in 1977; they had no children. In 1977, he married Betsy Ann Langman; they had two children: Benn and Jessica. His niece Sandra Schulberg was an executive producer of the Academy Award nominated film Quills, among other movies. His mother, of The Ad Schulberg Agency, served as his agent until her death in 1977. His brother, Stuart Schulberg, was a movie and television producer (David Brinkley's Journal, The Today Show). His sister, Sonya Schulberg (O'Sullivan)(1918-2016) was an occasional writer (novel They Cried a Little and stories). Budd Schulberg died in his home at 12 Saint George Place, Quiogue, New York, aged 95. ↑ Tanz, Jason (7 Feb 2003). "Lost Weekend: F. Scott and Budd Go to Dartmouth". The New York Times. ↑ Cullum, Paul (6 July 2006). "A Face in the In Crowd". LA Weekly. ↑ Kennicott, Philip (29 Nov 2005). "Art of Justice: The Filmmakers At Nuremberg". Washington Post. ↑ Joyce, Gare (June 2004). "Unrepentant". The Walrus. ↑ Trussell, C. P. (24 May 1951). "Schulberg Tells of Red Dictation: Move To Control His Writing Cause Him to Leave Party" (PDF). The New York Times. [Schulberg] testified voluntarily before [HUAC] today that he became a Communist during the late Nineteen Thirties but quit the party when it tried to dictate what he should write…. He named John Howard Lawson, one of the Hollywood Ten, as trying to pressure him to write under party guidance, and 'named names' of Waldo Salt, Ring Lardner Jr., Lester Cole, John Bright, Paul Jarrico, Gordon Kahn, writers; Herbert Biberman, director; and Meta Reis Rosenberg, agent. ↑ "Budd Schulberg: A Knockout Collection". Chicago Tribune. 13 August 1995. Retrieved 8 September 2016. ↑ "IN SHORT:NONFICTION". New York Times. 9 July 1995. Retrieved 8 September 2016. ↑ Beck, Nicholas (October 2001). Budd Schulberg: A Bio-bibliography. Scarecrow Press. ISBN 9780810840355. "All of the Jewish communists were attracted to her, because she was a gorgeous gentile princess accessible to Jewish communists because she was a communist"
Beck, Nicholas. Budd Schulberg: A Bio-Bibliography Lanham, Md. : Scarecrow Press, 2001. 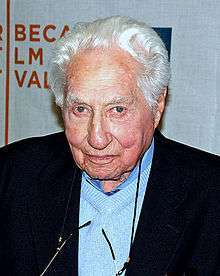 Wikimedia Commons has media related to Budd Schulberg. Weiner, Tim (5 Aug 2009). "Budd Schulberg, 'On the Waterfront' Writer, Dies at 95". The New York Times. 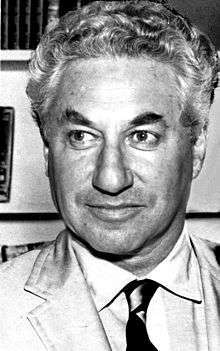 "Obituary: Budd Schulberg". The Daily Telegraph. 6 Aug 2009. Kurt Vonnegut (Winter 2001). "Budd Schulberg, The Art of Fiction No. 169". The Paris Review. "Corruption Found at Waterfront Watchdog" New York Times, August 12, 2009. Article mentions Schulberg and his book On the Waterfront in noting similarity to recent allegations.